C1 devices are single-width "connectors". They occupy one "C" socket on the standard tile and install alongside "M" Tibbits. 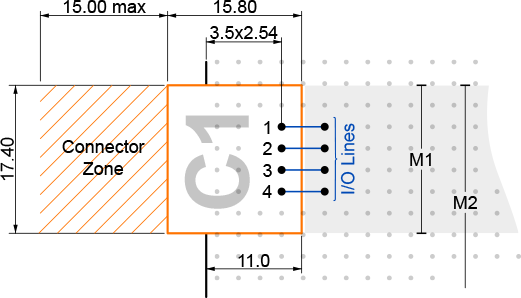 C1s have the equal width and height with M1T devices. 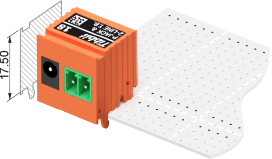 Tibbit "connectors" have hooks that hold on to the host board's edge thus adding mechanical stability. Some C1s are really just connectors of the power jack, terminal block, etc. variety. Others "sense" the outside world: temperature, humidity, vibration, and so on. C1 Tibbits are always orange. C1s never have status LEDs. All four pins are I/O lines that connect directly to four I/O lines of the adjacent "M" socket. There are no dedicated ground or power pins. Many C1s don't need ground and power anyway -- they house connectors and nothing else. If an attached external device needs ground and/or power then these must come from the adjacent "M" Tibbit. Ground and power are also necessary for "sensor" C1s. For example, Tibbit #28 is the ambient light sensor. it houses active circuitry which requires 5V power. Two of this device's pins are I2C clock and data, the third pin is +5V power, and the remaining pin is ground. This C1 device must be used in conjunction with Tibbit #00-3, which passes through 2 lines of the I2C interface, and also provides power and ground.